36% of respondents blame women's clothing for sexual harassment while only 9% blame men's conduct. 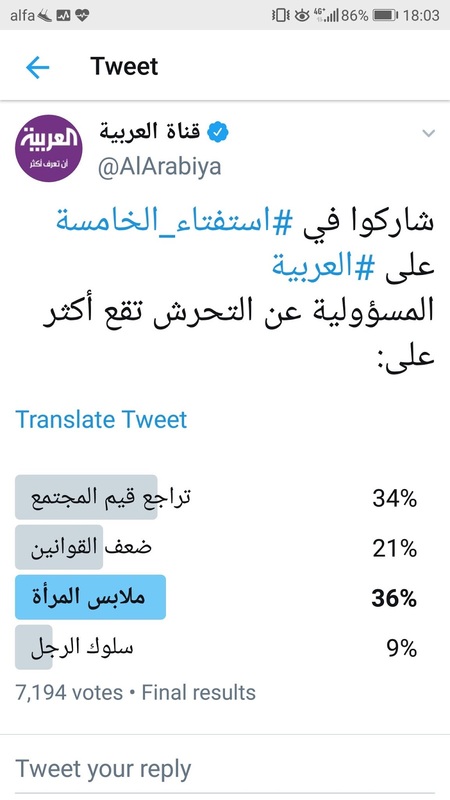 This is information from someone who went through it: when an Arab is interviewed for a job at Human Rights Watch one of the first questions asked during the job interview is: are you willing to work with Israelis because part of our work entails dealing with Israelis. My weekly article for Al-Akhbar: "The Mystique of Marxism in the 21st century". My article for Consortium News on anti-Semitism and Jeremy Corbyn. I don't understand why people who like Elie Wiesel and approve of his politics and his posturing would not concede that his writings have no literary value whatsoever. The titles of his books are more like titles of bad B movies, and the narratives in all of them are like articles you read in the Atlantic (when it was under the editorship of the former Israeli military prison guard). In the Sea is Never full (how profound), he tells a story: how the Palestinian poet Rashid Husain contacted Wiesel and assured him that he is not a dangerous Arab and not even a PLO and that he is "an Israeli". He met with Wiesel and showed him a list of Israeli repression, injustices, and censorship. Wiesel said that he did not believe what he heard and that he contacted an Israeli Jewish journalist to verify (because Arabs are liars) and that the Israeli journalist verified what Husayn had told him. So Wiesel went to Golda Meir who basically told him to mind his own business. The irony is that Wiesel never ever criticized Israel. So it works: what Meir ordered him to do. Here is a link to my interview with The Real News on the political developments in Gaza. "Sadat’s security, however, is good and the Egyptians are aware of the threat." My article for Al-Akhbar: "Walid Jumblat honors French colonialism and reminds it of Mukhtarah's alliance with it." PS This is the official response of the party's mouthpiece to my article. 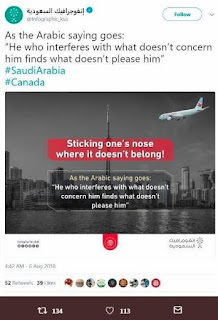 An official Saudi regime page threatens Canada and the Canadian people with a Sep. 11 of their own. Where is the outrage? My weekly article: "Refutation of Zionist Propaganda: the Documentary on Al-Arabiyya: an abstract about Nakbah II". 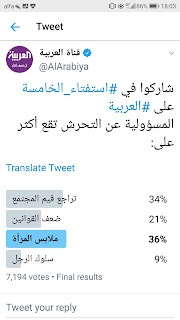 I today learned that the authorities in Syria have banned a whole number of books in the Damascus book exhibit even by writers who support the Syrian regime in the region. "One of the men he met there was Abdullah Azzam, a member of the Muslim Brotherhood"." It is being widely circulated by professional Saudi regime propagandists. Look at this: "and the bowls of dates and chocolates that mark the three-day festival that follows it sit on tabletops throughout the house." He thinks that Muslims (and Arabs) don't eat dates and chocolates except on holy days. “I depend way too heavily on Google Translate, both for work and in my personal life. For accurate translations I rely on an excellent support staff”. I like how unaware he is of the blatant incompetence and ill-prepeaation that he is admitting to here.